Cacimba do Padre Beach, Fernando de Noronha, Brazil. Cacimba beach is one of the longest beaches of Fernando de Noronha, said to be about a kilometer long. Cacimba do Padre beach is also known as the Priest’s fountain beach. Originally, the beach was called the Quixaba beach, till a fresh water fountain was discovered by a Portuguese Padre. It was then the beach was given the name Cacimba do Padre. 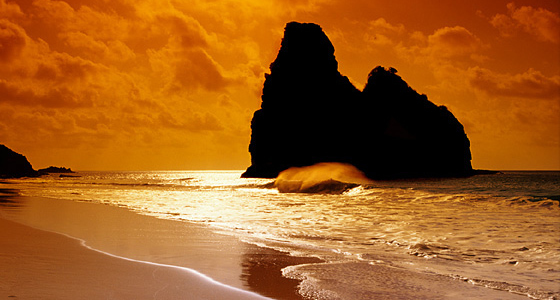 Cacimba beach is also one of the longest beaches of Fernando de Noronha, said to be about a kilometer long. The sand on this beach is very soft and you will also find a good number of shells to pick up as take away. The beach is surrounded by native forests and hills on all sides. One of the important attractions of this beach is the Morro Dois Irmaos or famously known as the Two Brothers or Hill Brothers. It’s a pair of identical rocks. You can also see from here the Americano and Bode beaches adjacent to the Cacimba beach. Remains of a Conceicao chapel, about 28 houses used for prisoners and an artillery battery used in World War II can be seen here. Apart from the historic sites, you can enjoy sea bathing for which the beach is quite famous and the waves here during summer are famed as the heaviest of all, which makes this a paradise for surfing.